During the Imperial Wars (1689-1762) against Spanish and French colonies, regiments completely separated from the militia system were raised for specific campaigns. These units, called Provincials, were patterned after regular British regiments and were recruited by the individual colonial governors and legislatures, who appointed the officers. Bounties were used to induce recruits, and the officers enjoyed a status greater than that of equivalent militia officers. Although new regiments were raised each year, in most colonies a large percentage of officers had years of service. Provincial field officers tended to be members of the legislature who had compiled long service in the militia. The company officers, responsible for most of the recruiting, were drawn from popular junior militia officers with demonstrated military skills.6 The most famous Provincial units were formed by Maj. Robert Rogers of New Hampshire during the French and Indian War. His separate companies of rangers were recruited throughout the northern colonies and were paid directly by the British Army. They performed reconnaissance for the regular forces invading Canada and conducted occasional long-range raids against the French and their Indian allies. The French and Indian War was different from earlier wars in one very important way. Formerly Great Britain had been content to leave fighting in North America to the colonists and had furnished only naval and logistical aid. William Pitt’s ministry reversed that policy, and the regular British Army now carried out the major combat operations. The Provincials were relegated to support and reserve functions. Americans resented this treatment, particularly when they saw British commanders such as Edward Braddock and James Abercromby perform poorly in the wilderness. At the same time, Britons formed a negative opinion of the fighting qualities of the Provincials. British recruiting techniques and impressment of food, quarters, and transport created other tensions: The resulting residual bitterness contributed to the growing breach between the colonies and the mother country during the following decade. 5. Benjamin Church, The History of the Great Indian War of 1675 and 1676, Commonly Called Philip’s War. Also. The Old French and Indian Wars, From 1689 to 1704, ed. Samuel G. Drake (Hartford: Silas Andrus & Son, 1854). 6. Ranz E. Esbenshade, “Sober, Modest Men of Confined Ideas: The Officer Corps of Provincial New Hampshire” (Master’s thesis, University of New Hampshire, 1976). A change in British military policy was a catalyst for the controversy. After the 1763 Peace of Paris, London decided to create an American Establishment and to tax the colonists to pay for it. In the eyes of London planners, this army, patterned on a similar garrison stationed in Ireland for nearly a century, would serve several useful ends. It would enable the British Army to retain more regiments in peacetime than it could have otherwise. The regiments in America were to secure the newly won territories of Canada and Florida from French or Spanish attack and also to act as a buffer between the colonists and the Indians. The Americans felt that these troops served no useful purpose, particularly when the majority moved from the frontier to coastal cities to simplify logistics. As tensions rose, the colonists became more suspicious of British aims and increasingly saw the regular regiments as a “standing army” stationed in their midst to enforce unpopular legislation. 7. Basic sources for this section are the following: Alan Rogers, Empire and Liberty: American Resistance to British Authority. 1755-1763 (Berkeley: University of California Press, 1974); John Shy, Toward Lexington: The Role of the British Army in the Coming of the American Revolution (Princeton: Princeton University Press, 1965); and David Ammerman, In The Common Cause: American Response to the Coercive Acts of 1774 (Charlottesville: University Press of Virginia, 1974). When British troops returned to Boston in far greater numbers after the Boston Tea Party of 1773, the final phase of tension began. If Americans needed any further proof of British intent, this action and Parliament’s punitive “Coercive Acts” furnished it. Military preparations quickened throughout New England, and the First Continental Congress met at Philadelphia in September to direct a concerted effort to secure a redress of American grievances. New Englanders removed militia officers known to be loyal to the Crown and increased the tempo of training. By the autumn of 1774 calls arose for forming a unified colonial army of observation that could take the field if hostilities erupted.10 Similar trends, although less pronounced, existed in the middle and southern colonies. 8. John Todd White, “Standing Armies in Time Of war: Republican Theory and Military Practice During the American Revolution” (Ph.D. diss., George Washington university, 1978), pp. 1-111; Lawrence Delbert Cress, “The Standing Army, the Militia, and the New Republic: Changing Attitudes Toward the Military in American Society, 1768 to 18209′ (Ph.D. diss., University of Virginia, 1976), pp. 80-128. 9. Ronald L. Boucher, “The Colonial Militia as a Social Institution: Salem, Massachusetts, 1764-1775,” Military Affairs 37 (1973):125-26; Stewart Lewis Gates, “Disorder and Social Organization: The Militia in Connecticut Public Life, 1660-1860” (Ph.D. diss., University of Connecticut, 1975), pp. 35-38; Roger Champagne, “The Military Association of the Sons of Liberty,” New-York Historical Society Quarterly 41 ( 1957):338-50. 10. David Richard Millar, “The Militia, the Army, and Independency in Colonial Massachusetts” (Ph.D. diss., Cornell University, 1967), pp. 284-88; Peter Force, ed., American Archives: A Collection of Authentic Records, State Papers, Debates, and Letters and Other Notices of Public Affairs, 9 vols. (Washington: M. St. Clair Clarke and Peter Force, 1839-53), 4th ser., 1:739-40, 787-88; J. Hammond Trumbull and Charles C. Hoadley, comps., The Public Records of the Colony of Connecticut, 15 vols. (Hartford, 1850-90), 14:296, 308-9, 327-28, 343-46 (hereafter cited as Conn. Records); John Russell Bartlett, ed., Records of the Colony of Rhode Island and Providence Plantations in New England, 9 vols. (Providence, 18-64, 7:247, 257-71 (hereafter cited as R. I. Records); Nathanael Greene, The Papers of General Nathanael Greene, ed. Richard K. Showman et al. (Chapel Hill: university of North Carolina Press, 1976- ), 1:68-76; Historical Magazine, 2d ser., 7 (1870):22-26. 11. Force, American Archives, 4th ser., 1:739-40. 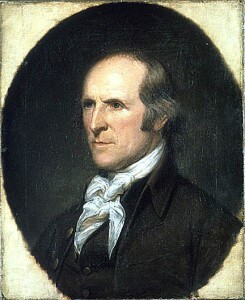 The First Continental Congress rejected a proposal by Richard Henry Lee of Virginia to form a nationwide militia but did adopt a plan for concerted economic protest. The plan provided for a boycott of British goods after 1 December 1774 and authorized forming enforcement committees which quickly became de facto governments at the colony and local levels. The committees also secured political control over the countryside, a control which British authorities were never able to shake. This political control included leadership of the militia, and that institution became an instrument of resistance to the British. Instead of being intimidated by Britain’s Coercive Acts of 1774, the colonists were moving toward armed resistance. Thus in the years immediately before 1775, tensions built to the point that the leaders in each colony foresaw the possibility of violence. They reacted by gathering war materials and restoring the militia (or volunteer forces) to a level of readiness not seen since the early days of settlement. British officers in America were aware of the colonists’ actions but dismissed them as “mere bullying.”13 Given these attitudes, the presence of Maj. Gen. Thomas Gage’s garrison in Boston, and the advanced state of preparation in Massachusetts, it is not surprising that war began in that colony. 12. Ibid., pp. 746, 841-45, 858, 881, 953, 1002, 1022, 1032, 1041-42, 1066, 1077, 1080, 1143-45, 1332-34, 1365-70; Paul H. Smith et al., eds., Letters of Delegates to Congress. 1774-1789 (Washington: Library of congress, 1976- ), 1:266-71, 298-301. 13. Hugh Earl Percy, Letters of Hugh Earl Percy From Boston and New York 1774-1776, ed. Charles Knowles Bolton (Boston: Charles L Goodspeed, 1902), pp. 35-37; see also W. Glanville Evelyn, Memoir and Letters of Captain W. Glanville Evelyn, of the 4th Regiment (”King’s Own”) From North America, 1774-1776, ed. G. D. Scull (Oxford: James Parker and Co., 1879), pp. 31-37. 14. Unless otherwise noted, this section is based on Force, American Archives, 4th ser., 1:830-53, 993-1008, 1322-69; 2:461, 524, 609-10, 663, 742-830, 1347-1518. After new elections were held, the Provincial Congress reconvened in February 1775. It clarified the Committee of Safety’s powers, reappointed the five generals, and added John Whitcomb, another politically active veteran, as a sixth general.15 The Congress also altered its basic military policy. In the face of increased tension, it took steps to augment the militia with a more permanent force patterned after the earlier Provincials. Regulations for this “Constitutional Army” were adopted on 5 April. The Provincial Congress made a momentous decision three days later. By a vote of 96 of 103 members present, a report on the “State of the Province” was approved. The report stated that “the present dangerous and alarming situation of our publick affairs, renders it necessary for this Colony to make preparations for their security and defence by raising and establishing an Army.” The projected volunteer force was to include more than just Massachusetts men, and delegates were sent to the other New England colonies to urge their participation. On 14 April the Committee of Safety was instructed to begin selecting field officers for Massachusetts’ contingent. These officers, in turn, were to assist the committee in selecting captains, who would appoint subalterns. Minuteman officers were given preference. Officers selected would then raise their regiments and companies, as the Provincial officers had done. 15. The age of some of the generals raises some doubt about their ability to take to the field: Pomeroy was 68, Preble 67, Whitcomb 61, Thomas 50, Ward 47, and Heath 37. 16. The testimony collected was published as A Narrative of the Excursions and Ravages of the King’s Troops . . . (Worcester: Isaiah Thomas, 1775). 13 the committee had approved an enlistment format; 8,000 effectives were to serve until 31 December in regiments consisting of a colonel, a lieutenant colonel, a major, and 9 companies. The committee planned to have each-company consist of 3 officers, 4 sergeants, a drummer, a fifer, and 70 rank and file, though it subsequently reduced the latter figure to 50. The pre-Lexington plan had been to form an army by apportioning quotas of men on the various towns, a traditional colonial device. The committee decided instead to have the generals survey the men at the siege lines at Boston to persuade them to remain. Its decisions were preliminary since final authority rested with the Provincial Congress. As confusion spread, on 23 April General Ward, the commander of the siege, suggested that the congress use smaller units to retain a maximum number of officers. The Provincial Congress incorporated Ward’s suggestions into a comprehensive plan that it adopted the same day. It called for a New England army of 30,000 men, of which Massachusetts would furnish 13,600. 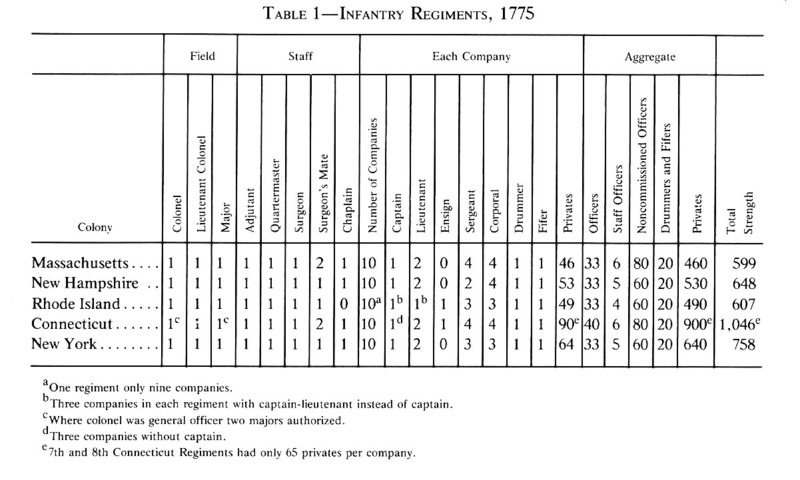 The regimental organization adopted for the infantry called for 598 men: a colonel, a lieutenant colonel, a major, an adjutant, a quartermaster, a chaplain, a surgeon, 2 surgeon’s mates, and 10 companies. Each company was to have a captain, 2 lieutenants, an ensign, and 55 enlisted men. On 25 April, following additional discussions with the Committee of Safety, this structure was confirmed with one change: it also accepted the committee’s suggestion that each regiment headed by a general officer have two majors. (Table 1) Finally, after some discussion, it approved pay scales for the new force.